Premium quality PVC tulip style favor boxes. Unique design, Super clarity. 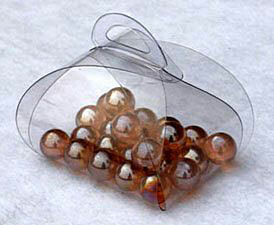 Great for gift packaging, party favors, wedding events. Use with wrapped candy. Length and width are measured from the bottom of the box the height is measured at its tallest point. Keep in mind that the sides taper in towards the top of the box.